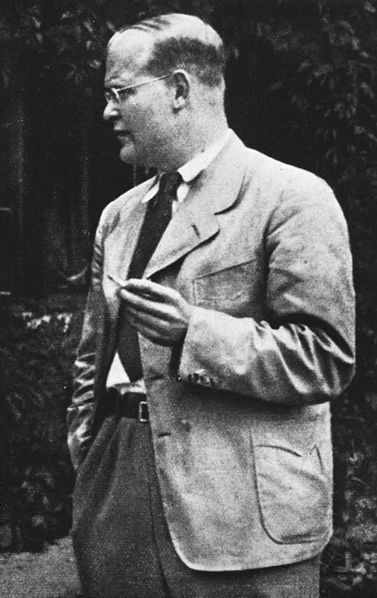 Dietrich Bonhoeffer was hanged in the Nazi concentration camp of Flossenbürg on April 9, 1945, just two weeks before the U.S. military came to liberate it. On October 8 [of 1944], Bonhoeffer was taken to the cellar of the Gestapo prison on Prinz-Albrecht-Straße, where he stayed until February 7, 1945. From then on, all correspondence came to an end, and contact between Bonhoeffer and the family and [Eberhard] Bethge was broken. From there Bonhoeffer was taken first to Buchenwald and then, via the village of Schönberg in Bavaria, to the Flossenbürg concentration camp, where he arrived on April 8. That evening he was tried by a hastily rigged court and condemned to death. Early the next morning Bonhoeffer was executed along with several other coconspirators. He was hanged April 9. His family would not learn about it for several months. May God lead us kindly through these times, but above all, may God lead us to himself. This is the end–for me the beginning of life. This post is adapted from a post I wrote around this time five years ago, as part of the “Tuesdays in Lent with Bonhoeffer” I was doing. See other gathered posts here. Engaging Bonhoeffer documents the extraordinary impact of Dietrich Bonhoeffer’s life and writing on later thought. Despite his lasting legacy, little substantial scholarship has been conducted in this area. In this magisterial collection, leading international scholars fill this striking gap and critically demonstrate the ways in which Bonhoeffer has been one of the most original, inspirational, and provocative writers of the twentieth century. Bonhoeffer’s work has proved foundational for a wide variety of thinkers and movements across such areas as ecclesiology, Christology, spirituality, ethics, hermeneutics, phenomenology, epistemology, and systematic theology more generally. Whether one considers his writings to have been faithfully interpreted, critically adopted or justifiably rejected, Engaging Bonhoeffer describes those who have engaged with Bonhoeffer’s work, been inspired by his actions, and found a way to express and explain their own ideas through interacting with his life and thought. In addition to shedding light on the different theological trajectories that Bonhoeffer’s work may forge, this challenging volume offers a critical window through which to view and appreciate the ideas of many leading voices of modern theology. Kudos to Fortress Press for keeping the Bonhoeffer goodness coming! Last fall they published reader’s editions of four classic Bonhoeffer titles. Kudos also to Fortress for publishing a Bonhoeffer book with a fresh photo of the man! Looks like a young Bonhoeffer, probably when he was a teenager getting ready to fire off a couple of dissertations. If/as I learn more about Engaging Bonhoeffer, I’ll post again here. In the meantime, the publisher’s book page is here. It’s on Amazon here. This post is adapted from a post I wrote around this time two years ago, as part of the “Tuesdays in Lent with Bonhoeffer” I was doing. See other gathered posts here. The Bonhoeffer Reader’s Editions are now available for public edification. Check out the details here. The set covers four classics: Discipleship, Life Together, Ethics, and Letters and Papers from Prison. Using the acclaimed Dietrich Bonhoeffer Works English translation and adapted to a more accessible format, these new editions of Discipleship, Ethics, Letters and Papers from Prison, and Life Together feature the latest translations of Bonhoeffer’s works, supplemental material from Victoria J. Barnett, and insightful introductions by Geffrey B. Kelly, Clifford J. Green, and John W. de Gruchy. Originally published in 1937, Discipleship soon became a classic exposition of what it means to follow Christ in a modern world beset by a dangerous and criminal government. Life Together gathers Bonhoeffer’s 1938 reflections on the character of Christian community, based on the common life experienced at the Finkenwalde Seminary and in the “Brother’s House” there. Ethics embodies the culmination of Dietrich Bonhoeffer’s theological and personal odyssey and is one of the most important works of Christian ethics of the last century. Letters and Papers from Prison presents the full array of Bonhoeffer’s 1943–1945 prison letters and theological writings, introducing his novel ideas of religionless Christianity, his theological appraisal of Christian doctrines, and his sturdy faith in the face of uncertainty and doubt. This four-volume set of Bonhoeffer’s classic works allows all readers to appreciate the cogency and relevance of his vision. If you’re new to Bonhoeffer, I’ve got a collection of posts gathered here. The Dietrich Bonhoeffer Works is already a well-done series; the idea of an even more accessible, annotated Bonhoeffer is also appealing. Check out more here, and when you click on the individual book images on the right side of the page, you can read samples from each of the volumes. 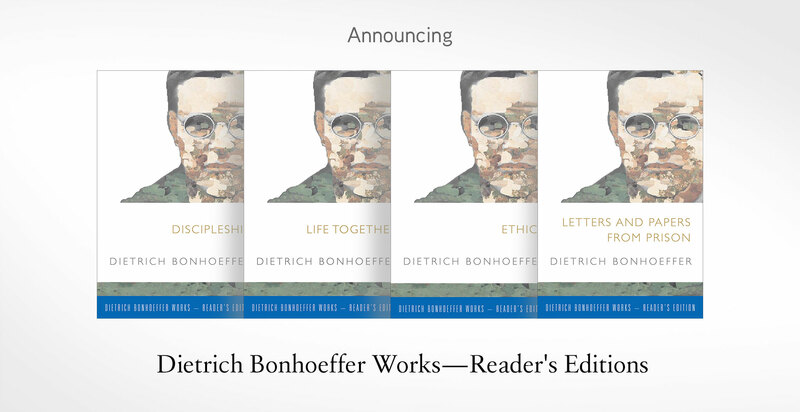 Big news for Bonhoeffer aficionados/as: Fortress Press, publishers of the 17-volume Dietrich Bonhoeffer Works (English edition), has just announced the Fall 2015 publication of Reader’s Edition volumes of Discipleship, Life Together, Ethics, and Letters and Papers from Prison. Featuring the acclaimed DBWE translation and adapted for a more accessible format, the new Reader’s Edition volumes include supplemental material from DBWE general editor, Victoria J. Barnett, as well as insightful introductions by Bonhoeffer scholars which clarify the theological meaning and importance of his work. New to Bonhoeffer? I collected some reflections on his writings after spending much of one Lent reading him. All my Bonhoeffer posts are gathered here. I reviewed the amazing Life Together and Prayerbook of the Bible (DBWE 5) here. It’s hard to imagine how the editors of the DBWE set could offer anything to improve upon those exceptional volumes, but I do like the idea of a more accessible, annotated Bonhoeffer. Check it all out here. This post is adapted from a post I wrote around this time last year, as part of the “Tuesdays in Lent with Bonhoeffer” I was doing. See other gathered posts here. I believe both the author and the subject [Bonhoeffer] would be disappointed if this book did not somehow draw you, the readers, closer to Jesus Christ and to your neighbor. Through Bonhoeffer’s inspirational words Jesus’ Sermon on the Mount seemed to be addressed to me personally for the first time. I was hooked. The Preface, after describing Kelly’s transformative first read of Discipleship, offers some helpful background information and resources for Bonhoeffer studies. Kelly mentions, for example, his involvement with the International Bonhoeffer Society, English Language Section. He writes about the International Bonhoeffer Congress. And he discusses the genesis of the Dietrich Bonhoeffer Works series (English translation), published by Fortress Press. Kelly’s “Biographical Sketch” is longer than Renate Bethge’s short work, and (obviously) a much quicker read than Eberhard Bethge’s monumental biography. 28 pages follow Bonhoeffer through his life, writings, and ministry. There are a few things that stand out about Kelly’s short biography. For one, though it’s scant on details of Bonhoeffer’s early life (to be expected, given its length), the overview is thorough and really orients the reader well to Bonhoeffer. Kelly has a knack for succinctly summarizing Bonhoeffer’s writings in understandable language–even Bonhoeffer’s challenging Sanctorum Communio! Second, Kelly’s biography is itself a gripping narrative. There is real movement as he progress through the various pastoral and academic positions Bonhoeffer held, from Berlin to London, from the seminary at Finkenwalde to the church struggle, Bonhoeffer’s arrest, and his imprisonment. I found myself wanting more dates in places (e.g., “Once back in Berlin…”–when? ), but perhaps this omission was deliberate to keep the narrative moving. I was not able to put the book down until I had finished the page-turner of a biography. Third, Kelly describes many of Bonhoeffer’s key terms and concepts, both in this first section and throughout Reading Bonhoeffer. Even a reader with little or no Bonhoeffer background will walk away from the biographical sketch with confidence to read any of Bonhoeffer’s writing. I was quite pleased with myself. Then the Bible, and in particular the Sermon on the Mount, freed me from that. Since then everything has changed…. It was a great liberation. It became clear to me that the life of a servant of Jesus Christ must belong to the church, and step by step it became plainer to me how far that must go. Kelly served as co-editor, with John D. Godsey, of Discipleship, volume 4 in the (English) Dietrich Bonhoeffer Works series (DBWE). This second section of Reading Bonhoeffer offers more than 60 pages of commentary on that well-loved Bonhoeffer book, known also as The Cost of Discipleship. Discipleship is a book in which Bonhoeffer uses Jesus’ own words as recorded in the gospels and the exhortations of the apostle Paul to confront readers with the uncushioned challenges to all their inaccurate ideas, falsified by Nazi propaganda, of what it means to be a follower of Jesus Christ. Readers of Discipleship will of course already know that much of the book exposits Jesus’ Sermon on the Mount, but Kelly’s unique contribution as a commentator here is in highlighting the historical context that makes Bonhoeffer’s writing even more remarkable. Not only does Kelly note a particular Nazi evil to which Bonhoeffer may have been alluding, he also points ahead in Bonhoeffer’s life to instances where he would live out the call of his own writings. As Kelly was co-editor of the DBWE volume, to read his chapter-by-chapter commentary on Bonhoeffer’s Discipleship is to have a guided tour by a leading expert, complete with summary statements and key quotes from that book. It’s well-footnoted with reference to the page numbers in the DBWE edition, so following up in Bonhoeffer’s text is easy. It’s an essential companion. The first Bonhoeffer book to be published in the DBWE series was Life Together, which appears as volume 5, bound together with Prayerbook of the Bible. Kelly served as editor of that volume, which includes an introduction and critical apparatus (i.e., lots of informative and orienting footnotes). As with the previous section of Reading Bonhoeffer, Kelly’s commentary on Life Together, although significantly briefer in its section-by-section analysis, serves as a really useful reader’s guide. Its introductory section in this book is thorough, drawing on Kelly’s introduction in the DBWE edition. This sets up the reader well to better understand Bonhoeffer’s important work on community life in the Church. Kelly, for example, points to “Bonhoeffer’s distinction between being with and being for the others in community.” He traces Bonhoeffer’s interest in building a community, going back even to socio-theological themes in Sanctorum Communio, Bonhoeffer’s first doctoral dissertation. Kelly summarizes and comments on each of the five sections of Life Together in turn: Community, The Day Together, The Day Alone, Service, and Confession and the Lord’s Supper. Kelly notes the tension that many students and readers of Bonhoeffer experience when they realize a conspirator against Hitler was a peace activist. After tracing the development of Bonhoeffer’s concern for peace, via an overview of his friendship with pacificst Jean Lasserre, Kelly looks at “three texts in which Bonhoeffer reveals himself as an uncompromising advocate for peace on the troubled earth where Nazism ruled with tactics of fear, violence, and the promise of a return to German military glory.” These include a 1932 conference lecture in Switzerland (with excerpts), a 1932 sermon (also with excerpts), and Bonhoeffer’s address to the Ecumenical Council of Christian Churches at Fanø, Denmark in 1934. Why do we fear the fury of the world powers? Why don’t we take the power from them and give it back to Christ? We can still do it today. The Ecumenical Council is in session; it can send out to all believers this radical call to peace. Kelly helps Bonhoeffer’s call to peace come alive for the reader many decades later. [Bonhoeffer] recognizes the danger posted by abandonment of Christ’s vision for the world and the manner in which even basically good people can succumb to the temptations to fall into the compromises in morality for which worldly attitudes are particularly prone, business and government plaudits given to acts of avarice and violence serving as prime examples of why it is necessary to be single-minded in following Christ. A re-read of every such sentence showed that it was generally clear enough. But additional punctuation or shorter sentences would have helped. If there are future printings of this fine book, perhaps this and a few other minor editorial oversights could be re-visited. Woven throughout Reading Bonhoeffer are “the twin aspects of Bonhoeffer’s spiritual legacy: scholarly expertise and pastoral care.” Kelly himself writes as one in the academy whose own pastoral sensitivity and concern is fully on display. I can only imagine how engaging and inspiring a Bonhoeffer course with him must be. Reading Bonhoeffer would be a stimulating read for pastors, theologians, seminary students, and Christians who are intent to more faithfully follow Jesus in both individual and community contexts. The discussion questions at the end of each section will facilitate this book’s use in a small group, Sunday school, or classroom setting. Kelly writes about Bonhoeffer, yes, but Bonhoeffer points so often and so clearly to Jesus, that a good commentary on Bonhoeffer (which this book is) will do the same. I am grateful for this short, hearty work that Kelly has written, and hope that more DBWE volumes receive similar treatment in the future. By the way–I’m also grateful to Wipf and Stock Publishers for the review copy. They’ve provided a 40% off coupon code to readers of this blog, good toward the purchase of Reading Bonhoeffer or anything else on Wipf and Stock’s site. Simply use the code LETTERS at checkout. It’s good through the end of May.